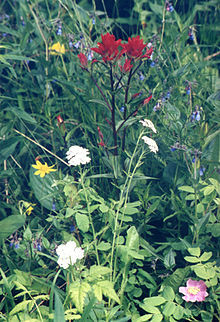 For other uses, see Wildflower (disambiguation). A wildflower (or wild flower) is a flower that grows in the wild, meaning it was not intentionally seeded or planted. Yet "wildflower" meadows of a few mixed species are sold in seed packets. The term implies that the plant probably is neither a hybrid nor a selected cultivar that is in any way different from the way it appears in the wild as a native plant, even if it is growing where it would not naturally. The term can refer to the flowering plant as a whole, even when not in bloom, and not just the flower. "Wildflower" is not an exact term. Terms like native species (naturally occurring in the area, see flora), exotic or, better, introduced species (not naturally occurring in the area), of which some are labelled invasive species (that out-compete other plants – whether native or not), imported (introduced to an area whether deliberately or accidentally) and naturalized (introduced to an area, but now considered by the public as native) are much more accurate. 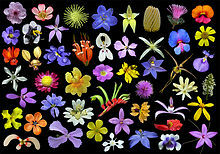 ^ Wild flowers can be found in deserts, forests, meadows, and fields. "wildflower". Retrieved December 5, 2014. Wildflower, noun. Any flowering plant that grows without intentional human aid. Wildflower in Cyprus Information on 1250 native plant species to North Cyprus.